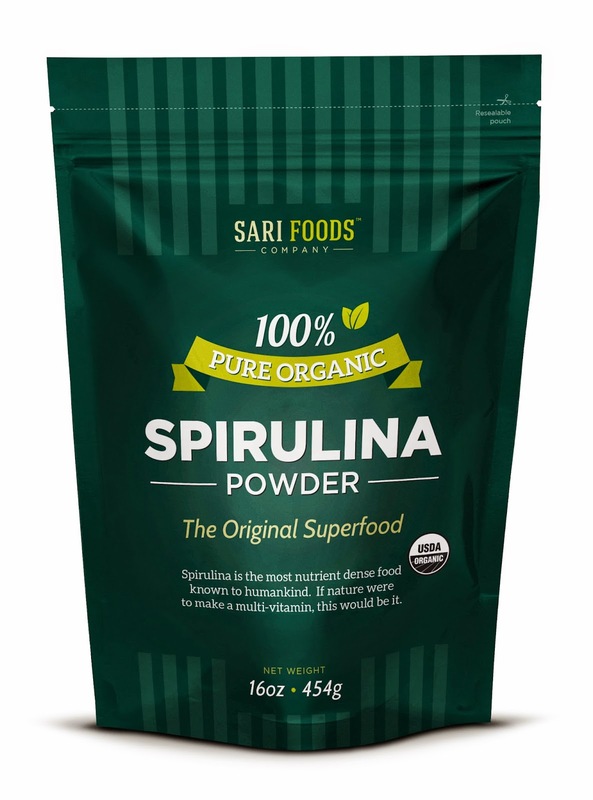 I received an amazing sized bag of this delicious and healthy Sari Foods Spirulina for this review. Shortly after it arrived, I realized I was pregnant and have had terrible morning sickness, so Duncan is now my short term supplement and food tester and taster. He told me that this Spirulina is clean and tasty and super high quality and who am I to argue. 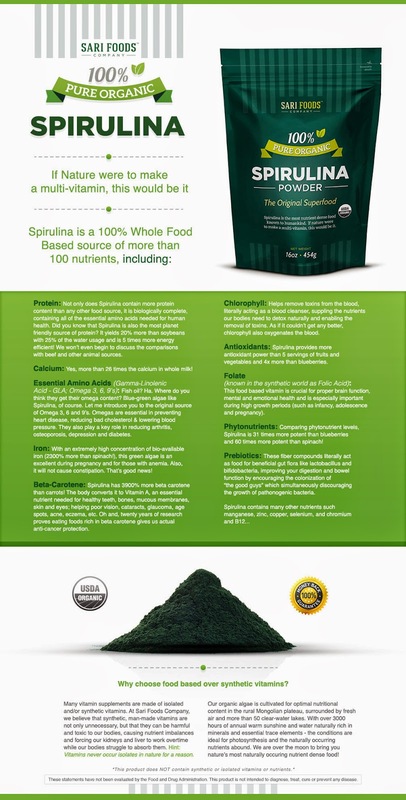 I have had Spirulina on my superfood list for along time. It is amazing and full of great stuff. Protein: Not only does Spirulina contain more protein content than any other food source, it is biologically complete, containing all of the essential amino acids needed for human health. Did you know that Spirulina is also the most planet friendly source of protein? It yields 20% more than soybeans with 25% of the water usage and is 5 times more energy efficient! We won’t even begin to discuss the comparisons with beef and other animal sources. Calcium: Yes, more than 26 times the calcium in whole milk! Essential Amino Acids (Gamma-Linolenic Acid - GLA; Omega 3, 6, 9's): Fish oil? Ha. Where do you think they get their omega content? Blue-green algae like Spirulina, of course. 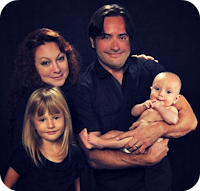 Let me introduce you to the original source of Omega 3, 6 and 9’s. Omegas are essential in preventing heart disease, reducing bad cholesterol & lowering blood pressure. They also play a key role in reducing arthritis, osteoporosis, depression and diabetes. Iron: With an extremely high concentration of bio-available iron (2300% more than spinach! ), this green algae is an excellent during pregnancy and for those with anemia. Also, it will not cause constipation. That’s good news! Beta-Carotene: Spirulina has 3900% more beta carotene than carrots! The body converts it to Vitamin A, an essential nutrient needed for healthy teeth, bones, mucous membranes, skin and eyes; helping poor vision, cataracts, glaucoma, age spots, acne, eczema, etc. Oh and, twenty years of research proves eating foods rich in beta carotene gives us actual anti-cancer protection. Chlorophyll: Helps remove toxins from the blood, literally acting as a blood cleanser, suppling the nutrients our bodies need to detox naturally and enabling the removal of toxins. As if it couldn’t get any better, chlorophyll also oxygenates the blood. Antioxidants: Spirulina provides more antioxidant power than 5 servings of fruits and vegetables and 4x more than blueberries. Phytonutrients: Comparing phytonutrient levels, Spirulina is 31 times more potent than blueberries and 60 times more potent than spinach! Prebiotics: These fiber compounds literally act as food for beneficial gut flora like lactobacillus and bifidobacteria, improving your digestion and bowel function by encouraging the colonization of “the good guys" which simultaneously discouraging the growth of pathonogenic bacteria.